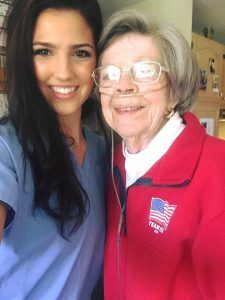 Alex McVicker, SIU pre-med student, visits with donor, Mary Rendleman. Some of SIU’s best and brightest students attended SIU’s third annual SIU Academic Scholarship Brunch Oct. 29 at the SIU Student Center Ballrooms. More than 375 students came dressed in their finest for the early-morning event to say thanks to their donors. SIU staff welcomed the students and the 116 donors who traveled to attend the scholarship brunch from locales such as California, Florida, Illinois, Texas and North Carolina. Vice Chancellor Jim Salmo kicked off the program by introducing Interim Chancellor Brad Colwell and Roger Tedrick, president of the SIU Foundation, who both gave a warm welcome to the 500 attendees. Donors Marsha and Gary Bertrand, longtime supporters of SIU, then addressed the room by sharing their story of how they were raised in a modest, small Illinois farming community, and how SIU provided Marsha Bertrand with the foundation necessary to become successful writer. The couple shared their commitment to supporting young people in similar circumstances through gifts to SIU. Avona Greene, a third-year SIU health care management major with a 4.0 grade point average, spoke on behalf of all the student recipients. Her speech eloquently described how the scholarships she received influenced her educational experience at SIU, and how important it is to make a positive difference in the lives of others. Alex McVicker, a senior in the SIU pre-med program, attended the brunch as a recipient of the Dr. David and Mary G. Rendleman Pre-Med Scholarship. The scholarship’s surviving benefactor, Mary Rendleman, was not able to attend the brunch, so McVicker decided to say thanks in person after the event. Arriving at Rendleman’s Carbondale home after the program, McVicker brought Rendleman a card and flowers. Rendleman was similarly touched by McVicker’s visit. The scholarship brunch was a wonderful opportunity for scholarship recipients to meet the generous donors who have helped them pay for their college education. Recipients were able to see that the names on their scholarships are people just like themselves who have a love of education – and a love for SIU, too.